When I was ten years old I got it in my head that I wanted to be a professional dancer. I talked to my dance teacher, read dance magazines, and discovered the best way to make this dream a reality was to dance as much as possible. Great! I love dancing! I will happily fill my days, evenings, and weekends with dance. I decided to ask my parents if I could go from dancing one night a week to four nights a week. We looked at the costs involved and my parents made me a deal. They would pay for one class a week. Any additional classes I wanted to take I would have to pay for. Then they made a brilliant suggestion. 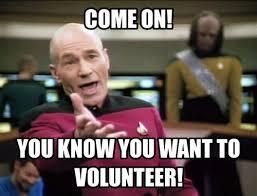 Talk to your dance teacher and see if you can volunteer in exchange for classes. I did and a beautiful, symbiotic relationship was born! As a teen I volunteered at my dance studio in exchange for classes. It is hard to say who benefited most from this relationship. I earned free classes and learned how to be a dance teacher and the studio got a front desk worker, substitute teacher, costume assistant, and proud ambassador of the dance studio. As I got older I parlayed this concept into other venues. I traded out babysitting for private dance lessons. I ushered in exchange for concert tickets. The list literally goes on and on. Volunteering is the best deal ever!